From last night's dinner, I realised that I still have some Japanese curry leftover. So thought it would be a good idea to make some pancake to go with it. 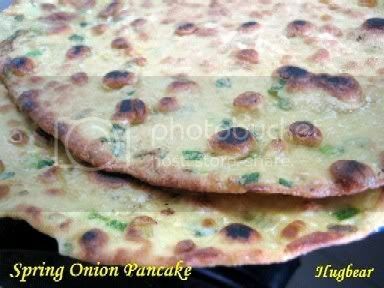 Here is the spring onion pancake that I did. 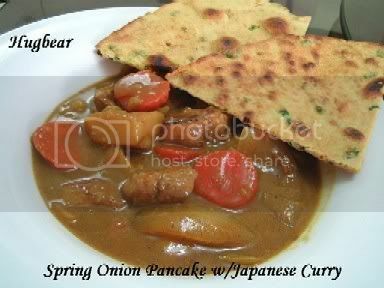 Gave some to my hubby with the Japanese curry. He said not bad. 1. Mix flour, instant yeast and baking powder in a bowl. Pour in the warm water and mix into a dough. Cover dough and leave it to rest for about 20 minutes. 2. Knead dough again until it is smooth. 1. Using your hand, spread the dough out. Add in spring onions and salt. Wrap the spring onion with the dough and mix it evenly. If it’s too wet, add more flour to knead until dough is easy to handle. 2. Roll dough into a long strip. Divide dough into 3 portions. Roll dough out into a thick round shape. Hot up a little oil in a frying pan. Put one piece of round rolled dough into the pan and fry for until slightly brown on one side. Flip over and fry for 1 or 2 mins. Add a little water and cover with a lid. Cook until water dries up. Continue to fry until both sides are golden brow. Dish out and serve. Long time did not log into your blog. Everything looks so yummy. Just 1 question. In the dough ingredients, you put baking powder but in the methos, it's written baking soda. Which is the correct one? Thanks. Oops, should be baking powder. I better amend it. This is another simple dim sum I used to make except fried wanton. I will also put some dried shrimps (ha mei) and cripsy minced bacon along with spring onioin. Chumpman, your version sounds more interesting.